Need Ski or Snowboard rentals for you and the entire family? Getboards has some of newest ski and snowboard rentals in Big Bear Lake. With great prices and friendly staff, our shop is ready to serve you. With 2 convenient locations on the blvd, 1 block from the village and less then 1 mile on your way to the ski resort. Since 1998, we have been in the business to make sure your vacation is the best ever. Getboards is the only Big Bear Mountain Rentals shop that offers our famous Slope Side Service! If you have any rental malfunctions while skiing or snowboarding, our Slope Side Staff comes to you on the mountain to fix it! Our rentals are guaranteed! We are a full service ski and snowboard shop with tons of gear to get you on the slopes. Because you're the one on Vacation! If you're looking to buy quality skis, check out our Armada Skis For Sale here. $19.99 Beginner Ski Package - Beginner Skis, Boots, Bindings, and Poles- Specifically Designed for Beginners. All ski rentals that we provide are newer! We rent nothing older then 3 seasons old. Brands: Salomon, K2, Fischer, Rossignol, Atomic Line, Nordica, Armada and many more to choose from! $23.99 Beginner Snowboard Package - Board+Bindings+Boots- Specifically Designed for Beginners. Brands: Burton, Ride, Rome, Arbor, Capita and many more... Try before you buy! Upgraded Boards and Demos are this seasons newer models. Online Reservations: Make your reservation and pay online now! Click here and you will be able to select the packages you wish to purchase. For multiple days just add quantities to your cart. You will get an email confirmation. You may rent after 4PM for the following day at no extra charge. Download 15% OFF Coupon! You can print or just show your phone to our cashier to receive this awesome deal! Group Rental Rates of 10 or more adults get 20% OFF, must pay all together to receive this discount. Are you driving a small vehicle and don't think your rentals will fit? For a flat fee of $20 each way, we can deliver and pick-up your groups rentals direct to the drop-off zone at the resort. Get fitted up in our shop and then we load your rentals in our delivery truck! Just meet us at the ski resort for you gear! Need your Ski Rentals Delivered to your cabin or hotel? Check out our Ski Valet Service! Getboards is in Business for a Purpose! A portion of your rental price goes towards these 3 non-profit organizations that our Staff has chosen to support this season. It's all about giving back. At Getboards our staff and team members have the same Vision and Purpose. Our focus is to Serve, so that your family vacation will be the best experience ever and to give back to others in need. This WHY we show up for work each day. Our Shop will have everything you need for the day. We are a Full Service Ski and Snowboard Shop located in Big Bear Lake. Need discounted Lift Tickets or the best Hotel rates? Book a night at one of our hotels and ask if they have discounted lift tickets available or for the best rate! Must Tell Them Getboards Ride Shop Sent You! Big Bear Lake Rentals. Skis, Snowboards, Kayaks, Bikes and Paddleboards. Big Bear is Southern California's Premier four season resort town for Biking, Kayaking, Paddle Boarding, Skiing & Snowboarding! 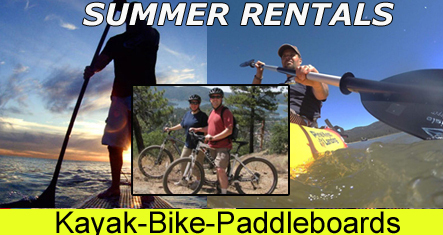 We specialize in Big Bear Lake ski and snowboard rentals, as well as kayaks, stand-up paddle boards (SUPS), and bikes. 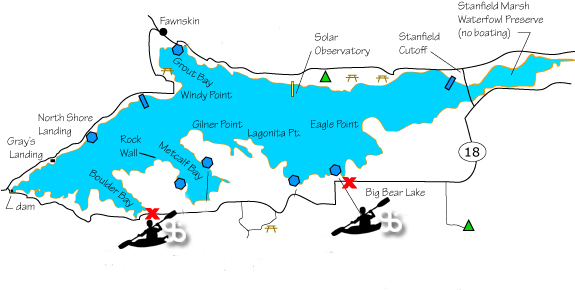 Choose from the best kayaking spots in Big Bear with CONVENIENT LOCATION On the lake so you don't have to transport the kayaks on your car! Delivery Service - Do you need your Kayaks or Bikes Delivered to your rental cabin or home? Our Shops specialize in a large selection of top quality rental gear, great prices and the best service on the mountain! Our knowledgeable and certified staff regularly maintain and inspect all rental equipment so your adventure can be fun & problem free, or your next rental's on us! It's your vacation, so we'll do our best to make renting with Getboards Ride Shop the best experience possible! All our kayaks come with life jackets, paddles and we offer no cleaning fees like the some marinas might have. All our kayaks come with free lake permits which makes it hassle free when renting with us. Get 15% Off Kayaks, Paddleboards and Bike Rentals! Download Coupon and print, or show image on your phone to our cashier. Delivery Service- Do you need your Kayaks or Bikes Delivered to your Cabin rental or home? We Deliver Free anywhere in Big Bear Lake on all full day rentals. Free Kayak Rental - That's right, If it's your Birthday, come into any location and get one FREE single person kayak for 2 hours (or 50% off a tandem). First come first serve! Then head over to Denny's and get your free meal! Can't beat that! !